I’ve made a great start to 2016 with the first book I’ve read this year. In Bitter Chill by Sarah Ward is her debut novel and it is excellent. I’ve been enjoying her book blog, Crimepieces, for a while now, so when I saw that she had published a book, I knew I had to read it. It will certainly be on my list of favourite books at the end of the year. 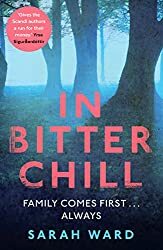 This is just the sort of book I love – excellent storytelling, moving smoothly between the past and the present as the secrets from the past gradually emerge, great characterisation and a superb location in the Derbyshire Peak District that Sarah Ward obviously knows very well. It is also a complex and puzzling mystery that kept me glued to the book. In January 1978 two eight-year old girls, Rachel Jones and Sophie Jenkins were walking to school together when a strange woman offered them a lift in her car. Rachel is later found in Truscott Woods but Sophie was never found. Move forward 30 years when Sophie’s mother commits suicide. Troubled by Yvonne Jenkin’s suicide, the police reopen the case – Superintendent Llewellyn who was on the original team asks DI Francis Sadler and his team, DC Connie Childs and DS Damian Palmer to see if there was anything that had been missed in 1978. Rachel has very little memory of the kidnapping as she was drugged and she has nothing to add to the statement she made as a child. But prompted by Yvonne’s suicide she tries to remember what had happened and as she is a genealogist her research into her own family history proves to be invaluable. The questions are which child was the target, why was Rachel the only one to escape and what is the significance of her missing socks? The tension and mystery ramp up with a modern day murder, when Mrs Lander, one of the teachers at the girls’ school is found dead in the woods where Rachel was discovered 30 years earlier. As I read I jotted down a few points that I thought were relevant. These were socks, illegitimacy, missing fathers and was Mrs Lander’s murder connected to the kidnapping and Yvonne’s suicide? It was only near the end of the book that I worked out why these points were relevant. Connie was my favourite police officer and I liked the relationship between her and Sadler and the competition between her Sergeant Damian Palmer. I also liked the fact that although there are violent deaths in this book they are not described graphically. The weather gets colder and colder as the chilling events unfold and the devastating family secrets are revealed. This is a powerful and well written crime fiction novel, one that I enjoyed immensely. I’m glad that there is to be a sequel, A Fragile Spring, which will be published later this year. I’m definitely looking forward to reading it. I was less certain about this. I thought the plot worked well enough, but I wasn’t convinced by the characters and some of the writing was excruciating. I am still umping and aching over whether I will bother with the second book. In the end I shall probably give her the benefit of the doubt and try it, but if there isn’t a great improvement then I’m afraid that will be it. Still, it would be a dull world if we all liked the same thing, wouldn’t it? It’s almost as though we read different books! Yes, it just shows we can’t all like the same thing. This sounds like a jolly good story so I’ll make a note and see if the library has it. Always good to start the year with a very good book and I’m happy to report that I have too. I’m so glad to read your review here, Margaret. I have a copy of In Bitter Chill and hope to read it soon. And by the way, I like your new look – on the blog I mean. I really liked this book very much, Margaret, and I”m glad that you did, too. I thought there was a very well-done sense of place, among a lot of other things.